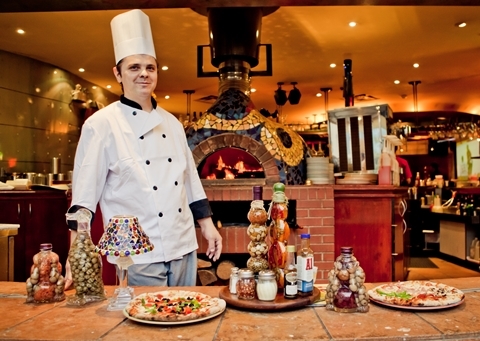 Niagara Falls, Ontario is home to the best woodfired pizza around at Coco’s Terrace Bar & Grill. The pizza is hand-tossed and topped with the freshest ingredients of your choice. Whether you’re a meat, cheese, or veggie lover, the open flame in the brick oven will cook and toast your pizza to perfection with a delicious hint of smoke in every bite. Woodfired pizzas have never been as popular as they are now. It’s probably because many people would say pizza is their favourite food and because true foodies can appreciate how the flavours of fresh ingredients are ignited by the flames of a woodfire. If you haven’t tried woodfired pizza yet, it’s a must! It’s pizza on a whole new level. Our staff will make your pizza just as you like – right before your eyes. It’s pizza and a show, from rolling out the dough, spreading your favourite toppings to watching your pizza bake in a brick wood fired oven. It makes for a unique and entertaining dining experience for any occasion. The next time you visit Niagara Falls, come and try our woodfired pizzas and other great tasting full menu options. We’re located in the heart of Niagara’s entertainment district, only a few steps away from the Fallsview Casino and beside the Holiday Inn.